From the Department of Neurology (M.R. ), University Medical Centre Maribor, Slovenia; the Department of Neurology (W.S. ), General Hospital of the City of Linz; the Department of Neurology (J.S. ), Christian-Doppler-Klinik, Paracelsus Medical University, Salzburg, Austria; and the Department of Neurology (J.S. ), Klinikum rechts der Isar, Technische Universität München, Germany. Thirteen years of existence, more than 1,000 members across Europe and beyond, and involvement in decision-making processes of European neurology are important milestones for the organization. Such a success story demands reflection on the previous work as well as a glimpse into the near future, especially at a time when collaboration with the newly founded European Academy of Neurology (EAN) is knocking at the door. The European Union (EU) acts as a single market that entitles citizens to live, travel, and work in the country of their choice. However, residency training is of national sovereignty. Hence, curricula, assessment methods, and even the definition of postgraduate training vary widely among European countries. There are more than 300,000 junior doctors across Europe.3 The focus and perspectives of junior doctors, regardless of their status as interns, residents, or fellows, are divergent from those of senior specialists. Naturally, their interests and needs are different from those of established and senior neurologists. Residents and fellows are the future of the field. Their involvement in decision-making processes in any matters related to their specialty and in both the national and European bodies are therefore of key importance. The first “Donausymposium” in 1962 can be regarded as the initial spark for the Pan-European idea in neurology. Two associations were critically involved in the rather young history of European neurology: the European Federation of Neurological Societies (EFNS, founded 1991) and the European Neurological Society (ENS, 1986). Notably, the organizations decided to merge to the EAN in 2015. The voice of junior neurologists was barely present until the late 1990s. A start was made with the foundation of the Junior Neurologists and Trainees (JNT) within the EFNS and an organization called the European Association for Young Neurologists in Training (ENT) affiliated with the ENS. Fruitful talks of JNT and ENT representatives revealed the common sense that junior doctors should safeguard autonomy and self-governance.4 Thus, the EAYNT as an independent nonprofit organization was launched in 2000, following unanimous voting for a fusion by the members of both organizations (figure 1). The willingness to take changes may have been based on the one hand on the idealistic concept of freedom to the practice of politics in ancient Greece.5 This particularly grants the chance for agility and quick decisions. On the other hand, self-governance provides the ideal basis for advocating without interference. However, this decision was associated with serious consequences: lack of funding and only minimal acceptance from major European bodies and organizations. These issues, however, were quickly offset by the ever-increasing number of members and enthusiasts who took over office positions. The executive body of the EAYNT is the office, which is elected annually at the general assembly (GA) at one of the 2 European neurology conferences. The office consists of 4 junior colleagues (president, secretary, treasurer, past-president). 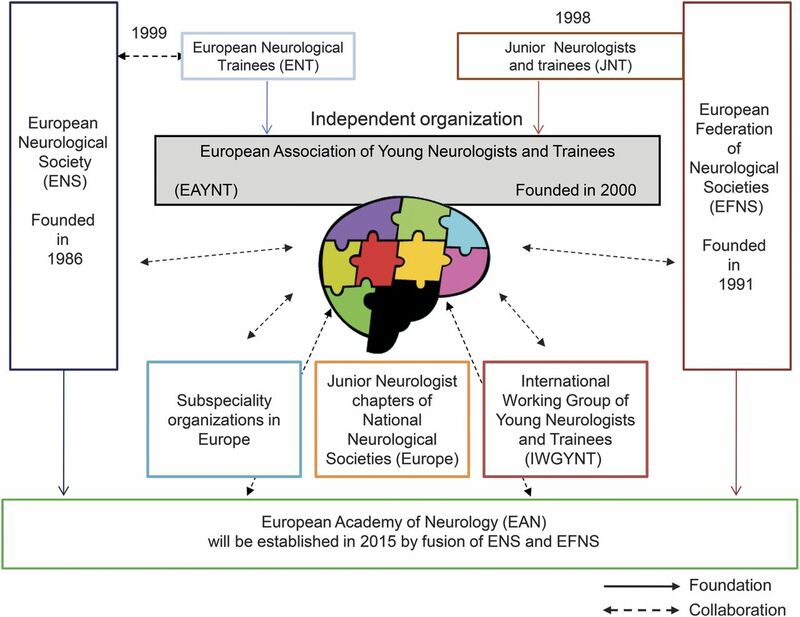 Until 2012, junior neurologists from 15 different European countries grasped the opportunity to get involved in the EAYNT office.2 The term of the office is 1 year and can be prolonged at the GA for another. Membership is free of charge and the application can be submitted through the Web site of the organization (www.eaynt.org). It is granted to every colleague undergoing training in neurology (and related fields such as neurobiology, neurophysiology, and neurosurgery) and to qualified neurologists under the age of 40 years. They should be based in Europe or hold interest in European affairs. Are we truly representing European young neurologists? Indeed, two-thirds of our members are younger than 35 years and are from 38 European countries (figure 2). Many countries have national junior neurologist sections, but the ever-increasing membership numbers reflect the interest in a Europe-wide representation. Geographically, most members are from Russia and Romania in the East and from Germany, Italy, and Spain in the West. Eleven percent of the members are not based within the European continent. These members are mainly living in Asia, followed by Africa and South America. 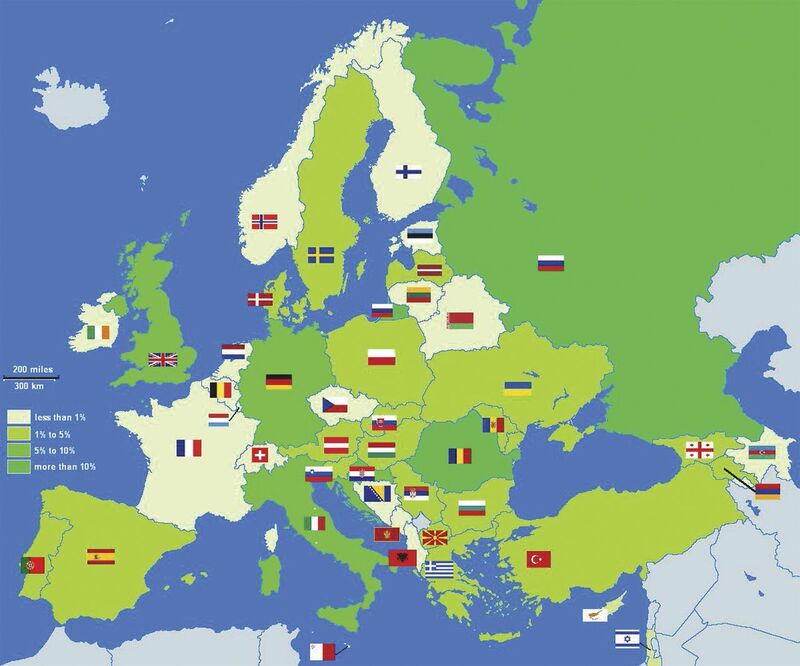 Percentage of members, alphabetical order: Less than 1%: Albania, Azerbaijan, Belarus, Belgium, Bosnia and Herzegovina, Czech Republic, Estonia, Finland, France, Ireland, Lithuania, Luxembourg, Malta, Montenegro, Norway, the Netherlands. From 1% to 5%: Armenia, Austria, Bulgaria, FYR Macedonia, Georgia, Greece, Hungary, Israel, Latvia, Poland, Portugal, Serbia, Slovakia, Slovenia, Spain, Sweden, Turkey, Ukraine. From 5% to 10%: Italy, Germany, United Kingdom. More than 10%: Romania, Russia. The organization lobbies for the interests of its members. This is undertaken through junior neurologist delegates nominated to different bodies and organizations. In the EFNS, these include positions within the education and teaching course committee, the liaison committee, and the scientific panel chair assembly. In the ENS, an EAYNT delegate fills the position of an observer to the Executive Committee. We are also prepared for activities within the newly formed EAN. There is an EAYNT delegate for the e-brain project, the world's largest, most comprehensive Web-based training resource in clinical neurology. In addition, the EAYNT is represented at the Danube neurology organization. With regard to EU organizations, there are close collaborations with the European Board of Neurology and the Permanent Working Group of European Junior Doctors. Concerns of major importance are published through different media, including articles in journals, newsletters, social media, and Web sites. A selection of recent articles is shown in appendix e-1 on the Neurology® Web site at www.neurology.org. Moreover, we organize workshops and roundtable discussions in the interest of junior colleagues at major European conferences. Of note, the leadership skills acquired by these activities were the basis for the clinical and scientific career of many office members, and many of them continued to work as advocates for education and research in order to advance the status of neurology. Improvement of clinical competence remains the basis for our efforts. We encourage junior colleagues to attend courses and workshops in Europe to improve their knowledge and gain insight into the broad European perspective. Through our members, by both individual training stories and structured surveys, we continuously monitor important aspects of postgraduate neurology education at the European level. Comparing assets and drawbacks in neurology training, the EAYNT is able to provide structured feedback to European bodies devoted to training.4 In addition to individual feedback, the EAYNT publishes surveys on a regular basis to provide comparative data on European structures. Support of clinical and scientific collaboration. The EAYNT regards Pan-European collaboration of utmost importance to broaden the spectrum of personal career development as well as to facilitate harmonization of European neurology education on an individual level. To support collaboration, we collect and screen grant and exchange options on a regular basis and publish these data online. In addition, the EAYNT maintains an exchange program entitled Open Facilities for Training in European Neurology (OFTEN).6 By these means, we hope to motivate residents to actively include international training exchange in their personal career schedule. Generation Y neurologists are digital networkers. We take this development into account by providing different online channels to stay in touch with European neurologists (mainly social media–based) and provide up-to-date data on exchange grants, training opportunities, and latest news. Our members employ these channels very actively. This online member service is also of major benefit for the EAYNT, being able to quickly contact and communicate with its members. However, we realize that face-to-face contacts are the basis for long-term relationships. EAYNT officers and supporters can be met at the booth of the organization at major European meetings. In addition, EAYNT hospital visits during European conferences have garnered considerable interest, as participants are able to witness the spectrum of European culture and compare distinct neurology practices, a teaching activity and a social program with the objective to interconnect residents for future collaboration and cultural exchange. The EAYNT has acquired an excellent reputation through its work on behalf of European junior neurologists. The positive feedback from all sides provides the breeding ground for continuing the advocacy mission in the interests of the European neurologist of the 21st century. Dr. Rakusa: acquisition of data, analysis and interpretation, first draft. Dr. Struhal: critical revision and intellectual contribution. Dr. Sellner: study design, concept, study supervision, critical revision. M. Rakusa reports no disclosures relevant to the manuscript. W. Struhal serves as a review editor of Frontiers in Neurology Education. J. Sellner serves on the scientific advisory board of Biogen-Idec Austria. Go to Neurology.org for full disclosures.
. History of the Peloponnesian War.New York: Penguin; 1974.
. International Issues: the EAYNT: ten years of unifying European junior neurologists. Neurology 2011;76:e4–e6. European Junior Doctors. EJD response to the consultation on the Green Paper “Modernising the Professional Qualifications Directive”. Available at: http://ec.europa.eu/internal_market/consultations/2011/professional_qualifications_directive/professional-organisations/ejd_en.pdf. Accessed April 24, 2013.
. The European Association of Young Neurologists and Trainees: advocating young neurologists in Europe. Eur J Neurol 2009;16:e146.
. Between Past and Future: Eight Exercises in Political Thought. New York: Penguin; 1993.
. The Open Facilities for Training in European Neurology (OFTEN): an emerging pan-European exchange programme for junior neurologists. Eur J Neurol 2012;19:e54–e55.